A Japanese man has died after being tackled by fellow train passengers who believed he had molested a woman during the morning rush hour. The man fled the train at a station in the city of Osaka after a 20-year-old student accused him of groping her. The 40-year-old was brought to the ground by four male passengers, who included at least one off-duty police officer. He died later in hospital. 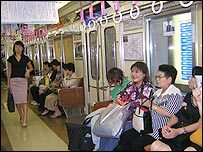 Women-only carriages run on some trains in Japan because of groping complaints. The college student accused the man of groping her on Tuesday, shortly after the train they were travelling in stopped at JR Tennoji Station in Osaka, Mainichi newspaper reported. He ran away but was chased by four other passengers, who tackled him on the platform. "We are looking into the cause of death and details about how he was overpowered by the passengers," a police spokesman told the French news agency AFP. Despite the introduction of penalties and women-only carriages, Tokyo police reported more than 2,000 groping incidents on the city's trains last year.